Hello and welcome to another Scrapbook Sunday Blog Hop! This month's theme is Winter or December Daily. If you have already been hopping you should have landed here from the fabulous blog of Sharon Dalton from Australia! She is amazing! There is sooo much creativity among this group! I hope you'll check out every blog so you can get inspiration from across the globe! 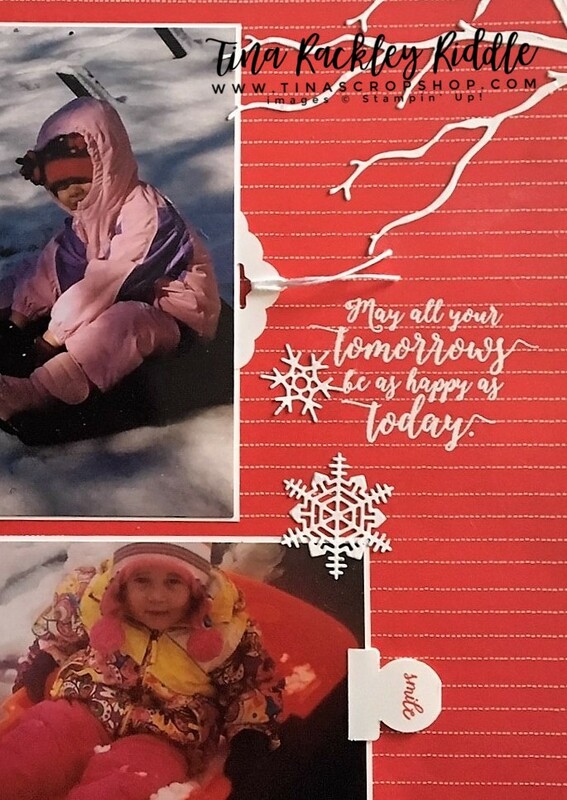 I found myself with some pictures of my granddaughters that still needed to be scrapped. I'm embarrased to tell you these are about five years old. Yes... that is how behind I am! One of my resolutions for the New Year is to get much of this scrapping done!!! 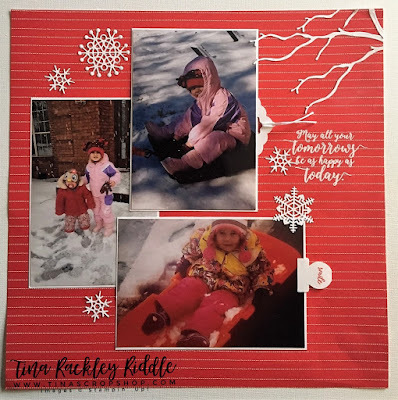 When I was trying to decide for a cardstock or DSP background I discovered that the beautiful Poppy Parade paper from Needlepoint Nook pack went perfectly with the sled and Laken's coat. I love the white stitching on the print and thought it would look beautiful with the snowflakes. 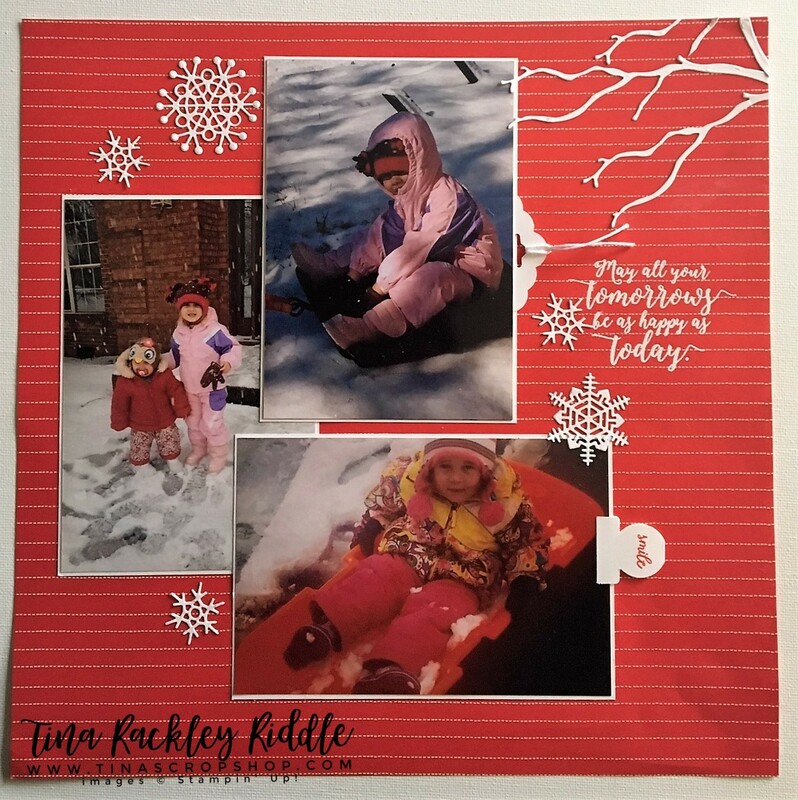 My snowflakes were from the amazing Seasonal Layers Thinlits... it is actually the perfect set for any scrapbooker! The branch is from the same die set and I cut a few of them as I was going for the look of a snow covered tree leaning down onto the page. I heat embossed the sentiment for the coordinating Colorful Seasons Stamp Set directly onto the page using my Stamparatus. I love that it has two open sides so that stamping on a large page is so simple! As usual I had to add some hidden journalling to hide my handwriting! I just put my adhesive on the top and bottom of my photos and viola... a place to tuck a journalling tag! I love the Scallop Tag Topper Punch for making tags.. another must have for scrapbookers! I love that I was able to use three pictures on this page... sometimes I try to do too much and can only scrap one or two pictures on a page! Up Next is Colleen Johnson! Just click her name and you'll be there!